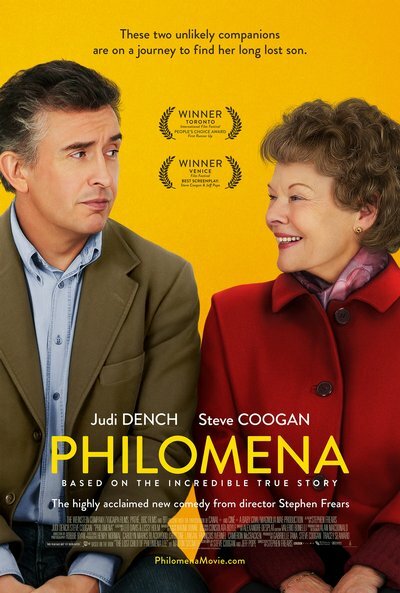 Story: Based on the 2009 investigative book by BBC correspondent Martin Sixsmith, The Lost Child of Philomena Lee, Philomena focuses on the efforts of Philomena Lee (Judi Dench), mother to a boy conceived out of wedlock - something her Irish-Catholic community didn't have the highest opinion of - and given away for adoption in the United States. In following church doctrine, she was forced to sign a contract that wouldn't allow for any sort of inquiry into the son's whereabouts. After starting a family years later in England and, for the most p art, moving on with her life, Lee meets Sixsmith (Steve Coogan), a BBC reporter with whom she decides to discover her long-lost son.